Whether you are looking to drop a few pounds or a few dress sizes, you may be envisioning a future full of rabbit food and rice cakes, but there is a better way! To hit your weight loss goals, it’s important to eat nutritional foods that will fill you up and keep you satisfied. Not only that, but these foods must also be delicious or else you won’t stay committed to eating them. Luckily, there are some wonderfully healthy foods that are both tasty and filling. Incorporate them into your meal plans, and you might just feel the most satisfied you ever have while on a diet! Forget about the neon yellow popcorn at the movie theater, you know—the one doused in liquefied butter and salt. Instead, opt for air-popped popcorn made at home. Popcorn is a whole-grain food that you can eat a lot of for minimal calories. For just 90 calories, you can enjoy three whole cups of air-popped corn, making popcorn the perfect snack for hungry calorie-counters. The best part is that popcorn serves as a blank canvas that can be tailored to your favorite flavors. Try sprinkling on red pepper flakes, lemon-pepper seasoning, or nutritional yeast for a unique, cheesy flavor. Baked potatoes are incredibly high in fiber while remaining low in calories. An average-sized potato has only 160 calories, and when you bake it in the oven you avoid the need to add any calorie-laden cooking oils. Sprinkle potatoes with salt and pepper and eat them with the skin to get the full nutritional benefits. Try topping your potato with a dollop of Greek yogurt for some healthy protein, or amp up the flavor with herbs and spices. 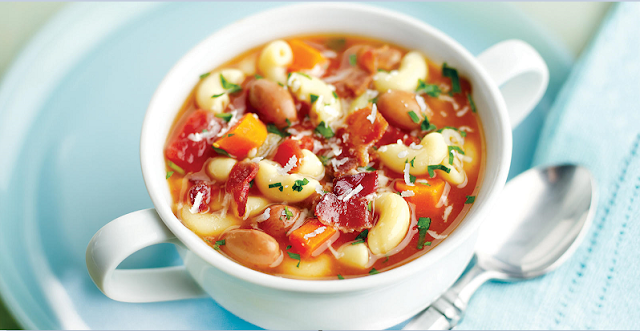 It’s easy to forget you’re on a diet when you’re tucking into a piping hot bowl of hearty soup. There is a variety of bean soups which will keep you full, thanks to the large amounts of water and fiber which work together to signal your body that you are no longer hungry. Experiment with lentils, black beans, kidney beans or split peas and you’ll be sure to find some delicious soups that will become a part of your regular meal rotation. Oatmeal is a high-fiber grain that soaks up liquid, and we’ve learned that the combination of fiber and water keeps us full for a long time. This morning staple can easily keep you satisfied until lunchtime, helping you meet your diet goals. You can doctor up your oatmeal with fiber-rich berries and protein-packed nuts to create a delicious breakfast that is also a nutritional powerhouse. Eggs are a complete protein, containing all of the essential amino acids that our body needs to suppress the appetite, making eggs a terrific food for those wanting to shed some pounds. For an easy meal that will keep you full, try scrambling a couple eggs with some spinach and mushrooms, and then top with your favorite salsa. Consider these foods secret weapons in your dieting arsenal, and you’ll be able to avoid even the most mouthwatering temptations. You’ll be able to eat more while gaining less, and the end result will be a happier and healthier you. Informational Credit to Intermountain HCG.